Gluten Free in Japan: Gluten Free Beer? Probably by pure chance, such thing exists in this country full of gluten. It is Kirin Nodogoshi <Nama> (キリン のどごし<生>). 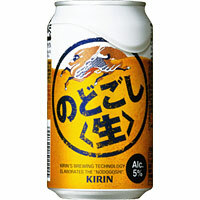 Well, to be exact, Kirin Nodogoshi <Nama> (キリン のどごし<生>) is a beer-like beverage, called happoshu （発泡酒）. To those who are not familiar with happoshu, it literally means "sparkling alcohol", but indicates beer-like drink with lower malt content. Low-malt drinks are taxed less than regular beer, and hence happoshu tends to be somewhat cheaper than beer. Ingredients listed on the can of Nodogoshi Nama are hops, saccharides, soy protein, and yeast extract. According to Kirin Customer Center (yep, I actually sent an email to them), it does not contain wheat or barley like normal beer does. However it may contain trace of wheat as it is produced in the same factory where other regular beers are produced. It is less bitter than regular beer, in my opinion, but it definitely has beer-like flavour. My grandpa has been happily drinking it since he started to live mostly on a pension. Note that not all happoshu are gluten-free. In fact, most of them are made of wheat or barley. This is one of a few kinds that happens to be gluten free. You should be able to find Nodogoshi Nama in most of supermarkets, convenient stores etc., as you may have seen its ads everywhere. Happoshu in general, however, is often not sold at restaurants unfortunately. I haven't really seen many BYOB restaurants in Japan, but if you become friends with master of your favorite restaurants, maybe one day, they might let you bring your own gluten-free alcohol... ?